January 17, 2019 – In the spring of 2017, a break-in that was as much spectacular as it was terrifying caught the attention of the media across the globe. In the early hours of March 27, 2017, the 100-kilo gold coin “Big Maple Leaf” was stolen from the Bode-Museum in Berlin. Now, the trial of the four chief suspects has begun at the criminal court Moabit of the Berlin regional court. 12 hearings have been scheduled. According to the Berliner Morgenpost, eight lawyers in total have been hired to represent the four defendants in court. The “Big Maple Leaf” was first exhibited at the Berlin Coin Cabinet as part of the “Goldgiganten” exhibit. Photo: UK. The police managed to reconstruct the progression of events shortly after the heist. CoinsWeekly reported on it. In the following almost two years, extensive investigations led to a significant body of evidence. During raids on July 12, 2017, 300 police officers searched 14 properties in Berlin and Brandenburg. Four suspects were arrested as a consequence. Three of them are part of the well-known Arabic-Lebanese clan “R.”. The fourth defendant was hired as a security guard for the museum by a subcontractor shortly before the crime. He is said to have delivered the necessary information required for a successful break-in. All four suspects were released shortly after the arrest. The stolen coin has not been found yet. Experts and prosecutors believe it has either been taken out of the country, smelted, or cut up and sold in small pieces. 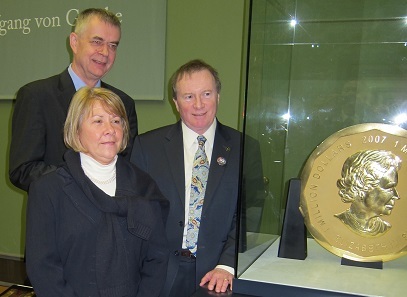 For four years after its issuance, the “Big Maple Leaf” held the record of the heaviest coin in the world. Only five pieces were produced in total; each one is worth 3.75 million euros. The first day of the trial, January 10, 2019, was met with great media attention. According to Focus magazine, approximately 80 journalists were present in the courtroom. The four defendants stand charged with aggravated theft. After breaking into the museum through the window of a changing room and smashing the glass of the coin’s showcase, the men allegedly maneuvered the coin out of the building on a creeper and then went on to haul it in a wheelbarrow across railroad lines to the getaway car. No further news came to light by the end of the first hearing. The Berliner Morgenpost reported that the defendants did not comment on the charges themselves on the first day of the trial. One of their lawyers Toralf Nöding, however, accused the prosecutors of not being able to present convincing evidence that would prove his clients’ guilt. He said, the video footage of a surveillance camera at the S-Bahn station Hackescher Markt did not allow for the identification of the alleged offenders. Nöding claimed, the evidence recorded in the investigation files – incriminating phone calls and internet searches, paper slips with current gold prices noted on them, and, according to Spiegel magazine, gold particles which had been found on the defendants’ clothes – was insufficient. The court’s verdict is expected to be rendered at the end of March. The defendants face several years in prison. As three of the four suspects were not yet 21 years old at the time of the break-in, the case is tried in the youth court and juvenile law might be applied in their sentence. News outlets at home and abroad reported on the beginning of this trial, including the German Die Zeit and die Berliner Zeitung, as well as the BBC and the Canadian National Post.